These days, we’re living in an ever-connected, social-savvy world. Research suggests the average American spends 116 minutes per day browsing social platforms. Amidst those Instagram masterpieces, and Facebook conversations, our chargers, cables and accessories have been striving to Anker you through (see what we did there?). It might take 116 minutes to get your daily fill of pet videos and PR nightmares , but it now only takes 2 minutes to find your perfect Anker product. Efficient. We’re delighted to introduce our brand new platform built specifically for Facebook Messenger. It’s available right now, and is designed to be your one-stop-shop for everything Anker. 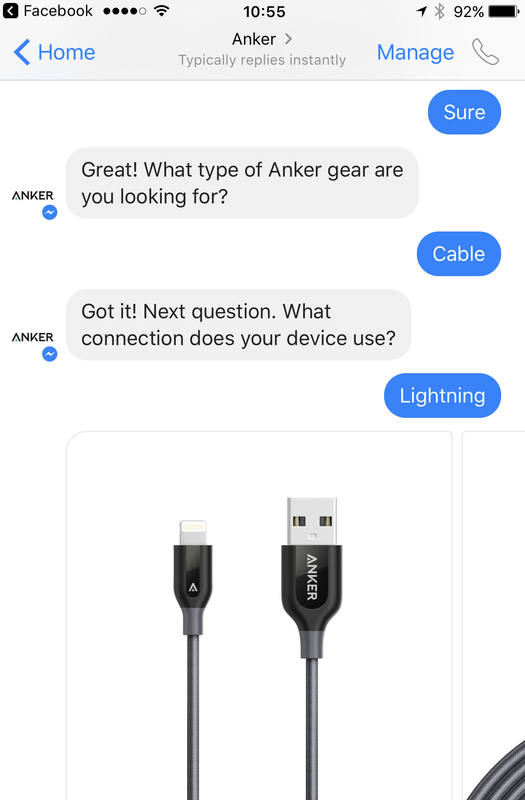 Our chat function finds your ideal Anker gear by asking a few simple questions. For example, if you’re after a wall charger, we can find your ideal PowerPort based on where you want to use it and how many devices you want to charge simultaneously. And the more you use it, the smarter it becomes. At Anker, we’re always innovating. Anker Chat is one of the first platforms on Messenger where you can purchase products directly via Facebook. That means you can find, and buy the perfect products without needing to leave Messenger. Integrated dialogue and checkout allows you to identify the best product, and purchase it in two shakes of a viral cats tail. It’s the most social way to buy online, and may well be the future of shopping. In the unlikely instance you run into any issues with your Anker gear, our smart FAQ feature will allow you to troubleshoot instantaneously using different remedies tailored to your product. To celebrate the launch of Anker Chat, we’ve got 2 special offers available on Messenger this week (April 19th to 23rd). Charge at home, or on the go with our 2-in-1 bestseller PowerCore Fusion 5000. We’ve got an exclusive, limited 20% off deal. Grab yours now for just $20.79, $5.20 off the Amazon.com price. If you purchase a cable, or any other product on top then your order will also qualify for free shipping. 200 PowerLine IIs to give away. Each completed referral earns 1 point. The first 200 who reach 5 referrals will get a PowerLine II completely free. Shopping has never been so simple and social… so what are you waiting for? Purchasing via Messenger is currently limited to the US, as are launch promotions. Quantities are limited, and are issued on a first come, first served basis. While I was at first disappointed when Facebook separated Messenger into its own app, I've been finding the Messenger app more and more useful. I'm surprised how responsive many organizations and businesses are to Facebook messages. For example, last summer I messaged a local park to see what time the pool was open and received a reply within an hour. Just the other day I messaged a local garage to get an estimate and they also replied in about an hour. Very convenient! I'm happy to see that Anker is embracing this technology. What can you use points for? I've been finding the Messenger app more and more useful. I'm surprised how responsive many organizations and businesses are to Facebook messages. I hope they didn't discontinue this future it was useful for people searching for which products to purchase or to ask basic questions. That's good I'm sure they'll have things back up and running soon.